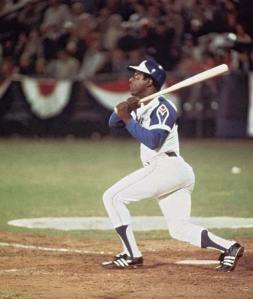 While the first month of each new MLB season is loaded with excitement and full of promise for every major league player, April 1974 couldn’t come soon enough for MLB Home Run King Henry “Hank” Aaron, who ended the previous season on the brink of the game’s most legendary home run achievement. The chase to pass Babe Ruth’s (then) all-time home run record of 714 reached a public frenzy in last days of the 1973 MLB season as 39-year-old Hammerin’ Hank hit his 40th long-ball (career homer 713) on September 29, 1973 to draw within a single home run of Ruth’s record, but failed in his quest to tie “The Bambino” for the greatest home run hitter to date as the season drew to a close. As a result, he had to endure a long off-season filled with nay-sayer’s hostile comments and threats from racists who did not want to see a black man break Ruth's home run record. Despite his bravery, Aaron admitted that he was extra diligent to assure that he would live to play another season; thereby fulfilling his lifelong quest to be the best. "I can't recall a day this year or last when I did not hear the name of Babe Ruth,” Aaron said. Later asked what was his most disappointing experience as he approached Babe Ruth’s record, he said: “The closer I got to the record, the more people started thinking that it wasn’t the most important record in baseball. I just wished for a moment that I could have enjoyed it as much as Sammy Sosa and Mark McGwire enjoyed in their chase (1998),” Aaron said. “Between the threats and all the controversy, my daughter (in college at Fisk University) wasn’t able to enjoy it. And I had to put my two boys in private schools, so they weren’t there to be bat boys. They weren’t able to enjoy it. So I was deprived of a lot of things that really should have belonged to me and my family. 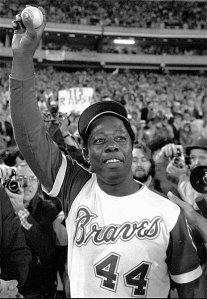 Thus, on April 8, 1974, Aaron returned to a record-setting Fulton Stadium crowd of 53,775 and a national TV audience tuned in to watch his attempt to surpass the Babe. Aaron hit career home run 715 in the 4th inning off Los Angeles pitcher Al Downing. The ball landed in the Braves bullpen where reliever Tom House caught it. While cannons were fired in celebration, two college students ran alongside Aaron around the base paths. To witness this historic moment, click on http://www.youtube.com/watch?v=OkjkgyhaNLE.